We have been following and supporting the work of Melbourne-based artist Kerry Armstrong for a few years now. 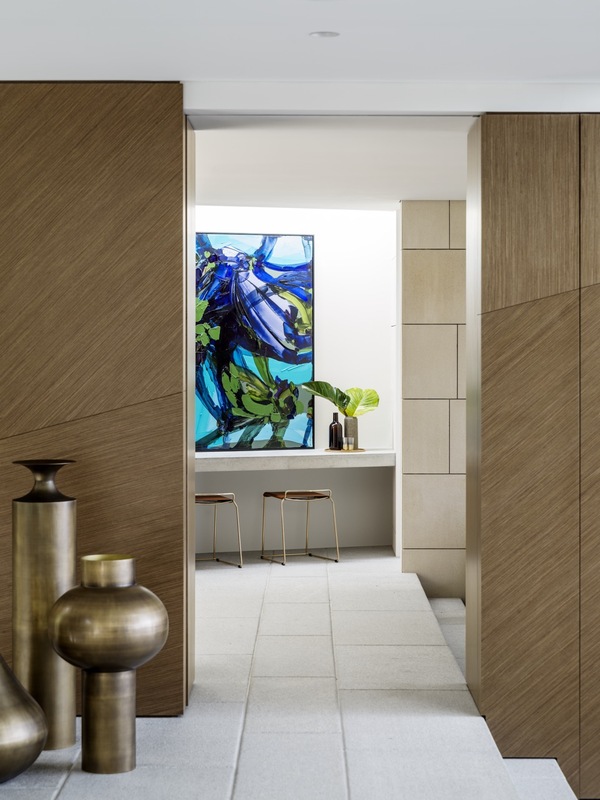 Many of her bold, striking artworks have found themselves right at home in several of our residential projects, providing the perfect complement to our interiors. We have been keen to sit down with the Abstract Expressionist painter to find out more about the inspiration behind her practice, life lessons, and what dreams she still wants to fulfil. I love this question! I remember vividly when I was about 5 years old folding a shirt for Mum (very much perfectly, Virgo style) and my determined aim was to make it look exactly like it was in a shop. She wasn’t an easy person to impress although her comments were that I could easily get a job in a shirt folding factory. My little heart burst with pride and instant ambition! I held onto that career aspiration for a long time and tragically still have a strong urge to refold jumpers in shops! My first pay packet was earned washing dishes and waitressing at a little Austrian restaurant in the Dandenongs. I worked there Friday, Saturday and Sundays and relished the ability to be independent financially. I remember buying my first pair of Staggers jeans at Merivale and Mr John in Melbourne and it felt like my life suddenly had no limits. Accepting the (concept) of perceived and real failure and understanding how far you can actually go once you’re on your life’s true path. These lessons rang true throughout my health issues with a brain tumour which was the impetus to let go of my old career to be my real self as an artist professionally. Personally, my two adult children who I have always dreamed of having. I used to talk about them way before they were born and nailed their personalities even then, they were always meant to be. They are strong, hardworking, kind, talented, ethical and my best friends. Professionally, the fruition of Studio Gallery Melbourne and now being represented by .M Contemporary in Sydney. I’m super excited to be included in their exhibition at the Sydney Contemporary this September! I am inspired by people who demonstrate honesty and strength. Turia Pitt blows me away with her complete and utter ownership of her life and even thinking about her fills me with admiration and awe without a shred of any other emotion. I once heard Quentin Bryce speak and felt very drawn to her manner and acceptance of life’s challenges and imperfections. She is a woman of true grit and emotional intelligence who also rocks a tailored suit, perfect hair and beautiful pearls! I'm an excess coffee drinker which has sadly flourished as it punctuates my studio/painting time. My ONLY other vice (!) are my never-ending hankering’s and proposals to my poor husband as to how we need to finish our renovation at home – with great style of course! I’m a complete homebody and adore our old place and garden and very much enjoy seeing it slowly come together. I think all humans do at different speeds, my personal style is tailored, Euro-influenced and uncluttered whether that be clothing or design. I think I’m still heavily influenced from a deep love and personal history of equestrian pursuits. I have plenty of them! I always have this sense of life and ambitious pursuits being at the very beginning which is where I believe you learn the most. One that comes straight to mind is another exhibition overseas - this time in London or New York! 'Our Midnight' In Water Series, Acrylic on Silk Poly, Framed in solid hand-stained Black Australian Oak. Working with AKD always feels like a perfect fit! The attention in the specifications are extremely well detailed, however the respect for my artistic process and integrity is always there. It’s always ridiculously exciting to receive the professional photographs of the works in situ! I will never tire of it. Visit Kerry Armstrong's website for more information.